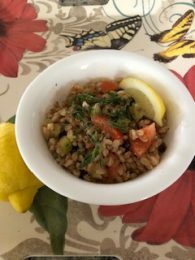 Farro is an ancient grain and it is a type of wheat. You can make the basic recipe and then decide to have it for breakfast or as a salad or a warm side dish. Basic cooking instructions: Rinse 1 cup of farro. Put in a pot and add 3 cups of water. Bring to a boil, reduce heat to medium/low and simmer for about 30 minutes. Drain any excess liquid. For breakfast: Add raisins, currants, nuts, coconut or a cut-up apple. Add maple syrup. Sprinkle with cinnamon or nutmeg. For a salad: Add any combination of sliced scallions, diced celery, carrots, sweet potatoes, or cucumbers. Add your favorite vinaigrette for the dressing. You can experiment with adding drained chickpeas. Or currants. Season with salt and pepper and dried herbs, like tarragon or thyme. For a side dish: Sauté some diced onions, celery, and carrots in oil until soft. Add to warm farro. Season with salt, pepper, and herbs, such as basil or dill.